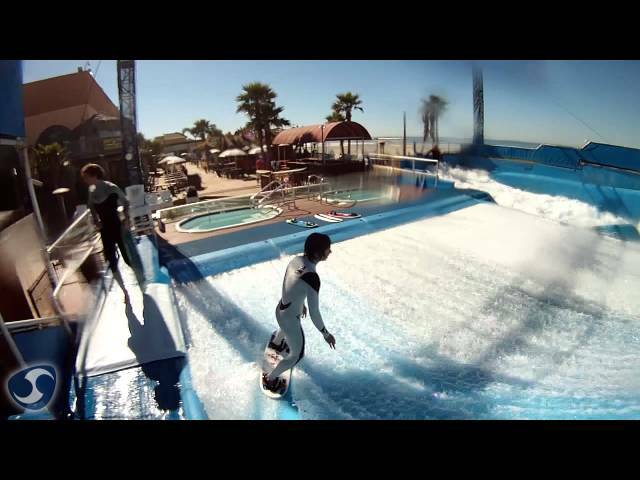 The FlowRider® generates a thin sheet of water which flows over a hill like shape in the form of a flawless ocean wave. The resulting wavelike shape and fast running water gives athletes of all ages the thrill of surfing. The FlowRider® is a unique innovation in water rides that is fun for everyone from kids to adults, but especially for that 13 – 29 age group; those who are so historically hard to impress, but who become addicted to the thrill and challenge of riding the FlowRider. The FlowRider appeals to a variety of board-sports athletes – surfing, snowboarding, wakeboarding, skimboarding, skateboarding – and the learning curve takes time, but is steep as riders progress from riding in a prone position on bodyboards, to standing up on flowboards, to doing ollies and flip tricks. The first ride on a FlowRider can turn into a life-time addiction, as first-time riders become repeat riders, and repeat riders become lifetime loyalists.